Corbyn seems less inclined to buy the 'compromises' that TTIP negotiators are selling - which campaigners have labelled 'lipstick on a pig'. But will our national parliaments even get a vote? 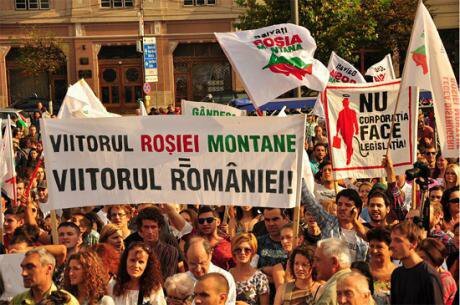 Romanian protests as Canadian company sues their government for trying to protect its mountains from gold-mining - TTIP is not the only threat. Campaigners against controversial EU/US TTIP ‘trade deal’ will have been heartened to see Jeremy Corbyn’s recent comments after being elected leader of the British Labour Party. “I want to see a Europe that …does not sign away a lot of public services across the whole continent through the Transatlantic Trade & Investment Partnership [TTIP] which is being negotiated secretly by the EU and the USA”,Corbyn told Jon Snow at the outset of his first full media interview. Corbyn has been one of the Labour MPs speaking out most vociferously against TTIP from the start. Here he is speaking from the backbenches in a Commons debate on the ‘trade’ deal back in January this year, issuing a “cri de Coeur for the freedom of people to elect a government which can decide what goes on inside its country”. Corbyn’s concerns about the anti-democratic, public services weakening nature of TTIP are understandable, given the developments over the summer. On 9 June, the European Parliament was due to vote on a set of recommendations and amendments on the EU’s negotiating position on TTIP. At the last minute Parliament president Martin Schultz postponed the vote, prompting outcry from anti-TTIP MEPs who felt they were being denied a voice. Shultz’s fellow German MEP, Bernd Lange, chairs of the International Trade Committee which prepared the draftrecommendations, supported the postponement, saying the Committee wanted more time to reach “a stable majority for the TTIP-resolution”. At issue was a serious disagreement among MEPs over the controversial Investor State Dispute Settlement (ISDS) which would allow corporations to sue governments in special tribunals. MEPs were responding to pressure from their constituents and it was unclear how the vote would go especially among the centre-left S&D group, one of the two main groups in the parliament. ISDS had become what the Financial Times, earlier this year, described as 'the biggest political obstacle to a deal', with popular opposition particularly strong in Germany, the EU's most powerful country. The document for the postponed June vote had kept what was essential to ISDS, namely the right of corporations to sue governments in special courts. But, as an alternative to secretive private tribunals, it had proposed an 'international investment court' which it said would be democratic and transparent. MEPs on the left and many in the S&D group were unhappy with this proposal, seeing it as ISDS in all but name. In the words of the UK social justice organisation, Global Justice Now, the alternative corporate court was 'lipstick on a pig'. Following the June postponement, the EU Trade Committee worked on a compromise text which it then presented to the Parliament on 8 July. Once again, the essentials of ISDS were retained but the new text dropped the international investment court and simply proposed 'to replace the ISDS system with a new system for resolving disputes between investors and states' (2.c.xv). The new system would be 'transparent' and 'public' with the right of governments to appeal. But it made no concrete suggestions about the structure of this new system. On 8 July, Schultz again invoked procedural rules to disallow any amendments on ISDS other than the compromise text from INTA. Schultz was accused by a representative of the Greens of having "twisted the meaning of parliament's rules of procedure to fit his political goals". All British Labour MEPs (bar one) voted against the document, which in their view still included the controversial ISDS system. So did all the French, Belgian, Dutch and Bulgarian S&D MEPs, alongside all of Europe’s Left, Greens and right-wing (EFDD) groups. But the S&D was split – the deal was backed by German and most southern and eastern European S&D MEPs, alongside Liberal and Centre right MEPs. So the full text with the ‘compromise’ amendment was passed with a large majority - 447 votes for and 229 against. Gianni Pittella, the leader of the S&D group in the European Parliament,proclaimed, "ISDS is dead". And this was how the new deal was presented to S&D members and to the wider public. The citizens had been listened to. Parliament had rejected ISDS, we were told. But there are many other questions, given the complex, rapidly developing and highly lucrative nature of the health ‘market’. How will TTIP intersect with the current global pressures to reconfigure how healthcare is arranged and regulated – both its delivery through staff, technology and drugs, and its funding through both public and private means - into a set of new, interlocking corporate-friendly systems? The document proposed and passed by Parliament on 8 July, if accepted by negotiators would strengthen the protections of health systems from TTIP. The right to renationalise would be explicit. New services and systems would be excluded from compulsory ‘markets’ unless they were specifically listed as included). And ‘exclusions’ of protected services would also apply regardless of how they were funded. But there’s a very big question about whether the negotiators, under pressure from the Americans, will actually accept this document. Even if they do, it does not fully exclude public services from the negotiations. And MEPs now face another problem. Having opted, however vaguely, for a 'new system' and having apparently rejected the old ISDS, they will be asked to ratify the free-trade deal with Canada (CETA) that has already been negotiated. But CETA contains the old ISDS. And, as we know from the Philip Morris case, where the tobacco giant sued Australia from its Hong Kong subsidiary, a US corporation doesn't have to be on its home turf to launch a suit against foreign governments. Most US corporations have branches in Canada. Shutting the stable door in TTIP while leaving it open in CETA would be a self-defeating strategy. CETA contains all those features which campaigners find objectionable in TTIP, not just ISDS and very weak protection for public services. So Commission promises about TTIP are meaningless in view of what has already been agreed in CETA. Will we get to discuss and vote for or against CETA – the Trojan horse trade deal – in our own national parliaments? That’s currently the subject of a legal battle to be decided by the European Court of Justice. The ECJ’s deliberations are likely to take some time. But it will be political decision, as most ECJ decisions are. So a political campaign will need to be mounted to insist that CETA and TTIP should be decided by national parliaments.